- Sound of the linotype casting machine being operated. John Kristensen practices a method of printing invented in the mid 15th century known as" letterpress." Text is set from individual pieces of hand-assembled metal type and then printed directly from the type. It was the dominant technology of the printing industry for 500 years. Though it became technically obsolete in the last quarter of the 20th century, it remains important because of its formative influence on all subsequent printing. John Kristensen discovered letterpress printing as a craft in the early 1970s. He apprenticed himself to Michael McCurdy at the Penmaen Press, then in Lincoln, MA. Recalling his initiation, "I was thrown into the deep end of design, editing, typesetting, and presswork." After two years, he and friend Carl Kay established Firefly Press. At the time, one colossally expensive typecasting machiner was being thrown away wholesale; presses and type were either free or scrap metal value. In addition, men who had spent careers in typecasting and letterpress printing, who were retired but still interested in the craft, were delighted to teach John their trade. This included the complex workings of the Monotype and Linotype casting machines. These are among the most complex mechanical devices ever mass-produced and in their day, they revolutioned the printing industry. Today, they remain nearly the only source of true metal type that is essential for traditional letterpress printing. Kristensen and Jesse Marsolais were awarded an MCC apprenticeship in 2009 specifically to work on typecasting. 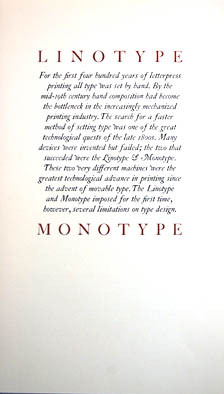 This entails not only the producing of metal type using the Monotype and Linotype machines, but operating and maintaining these machines, something which requires theoretical, mathematical, mechanical and practical expertise. John will teach Jesse how to run and repair the Linotype and the Monotype keyboard, composition caster, and display caster,"two monuments of mechanical engineering without wich traditional letterpress printing cannot hope long to survive. ".